Get help selling food in Minnesota. The Blazing Trails project can help you navigate the regulations. - But is confused or intimidated by food regulations. The topic of this quarter is Support for Healthy Eating. ABOUT: Living Well with Chronic Pain is a group workshop designed to help you live a healthy life with your chronic pain by managing your symptoms. Participants set goals and make a personalized plan to improve their health. Workshops are interactive and focus on peer support. 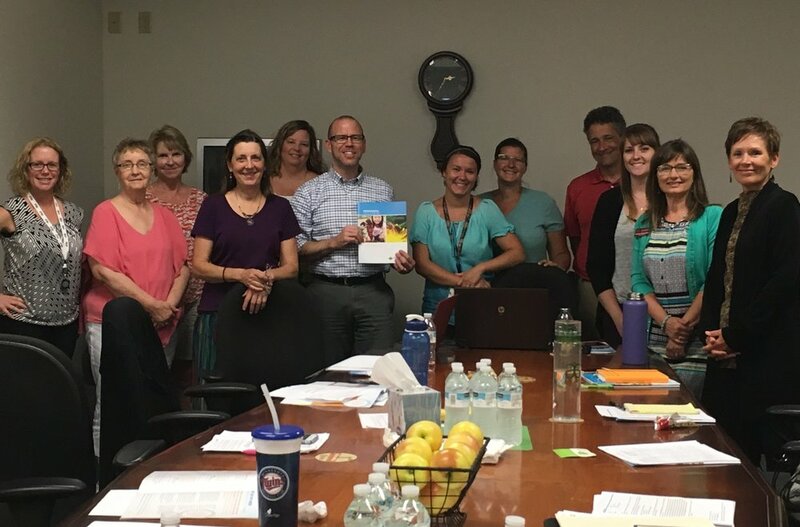 CONTACT: To learn more about registration and class content, call Wabasha County Public Health, 651-565-5200 or check out online information at wellconnectsemn.org. A group workshop that builds confidence and empowers older adults to carry out health behaviors that reduce the risks of falls. Older adults will learn about improving strength and balance, home hazards and modifications, safe footwear, vision and falls, community safety, bone health, and medication review. Participants will also practice a series of strength and balance exercises which have been shown to reduce falls. To register, call Wabasha County Public Health, 651-565-5200 or online at wellconnectsemn.org. Ask about scholarship and transportation assistance when registering. 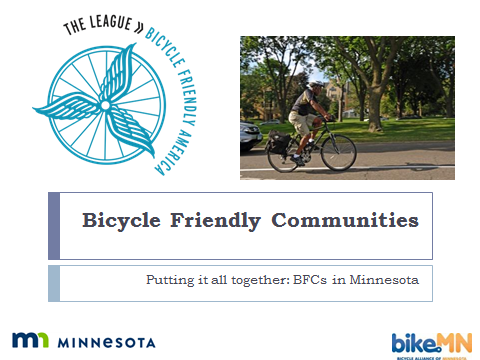 Sign up by June 7th by calling 651-3800-9068. Contact Tina at tmoen@co.wabasha.mn.us for more information. 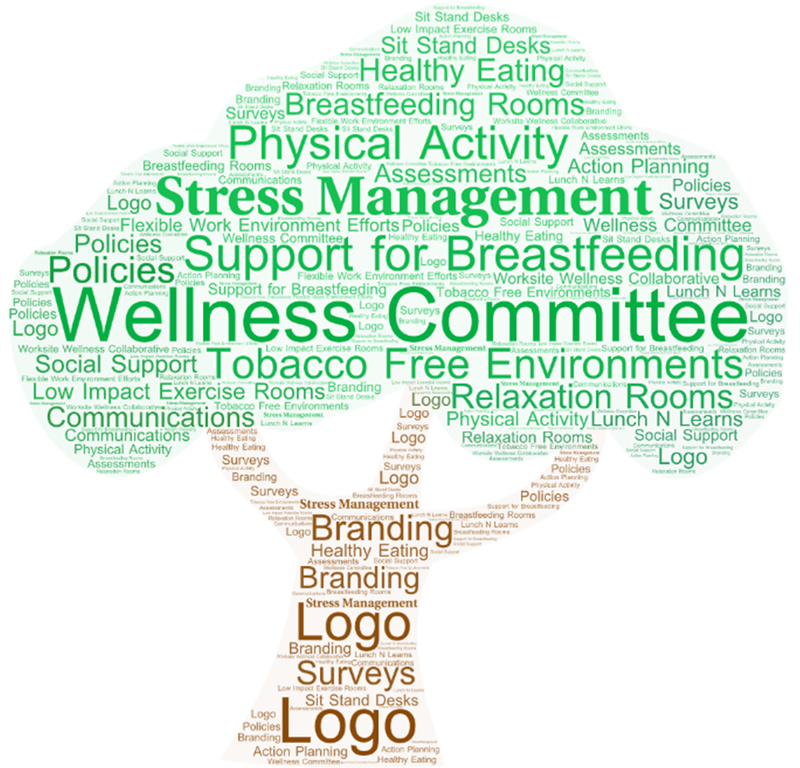 The topic of this quarter is Support for Breastfeeding. Register by calling Wabasha County Public Health at 651-565-5200 or online at WellConnectsemn.org. TIME: Tuesdays February 6 – March 13 9-11 a.m. When: January 29, 6-8 p.m.
(2 hours continuing education); Partners will stay after to work with Tina Moen, SHIP Coordinator, on action planning, etc. Tai Ji Quan: Moving For Better Balance is a falls prevention program delivered in two one-hour sessions each week for 24 weeks. Tai Ji Quan helps older adults improve their balance and reduce the likelihood of falling. Participants will learn balance skills, good body alignment and coordinated Tai Chi movements. Class meets on Mondays and Thursdays, 9:45-10:45 a.m., from January 15-April 5. Only $75 for 12 weeks/24 sessions. This program is brought to you by the Wabasha County Senior Action Team. Call Wabasha County Public Health to register 651-565-5200, or online at www.WellConnectSEMN.org. Need help with transportation? Ask about assistance when registering. A gathering for families in Southeast MN to discuss how we can improve healthy food access in our region. All while enjoying a free locally grown meal! We want your voice at the table! Discuss our strengths and weaknesses. Hear what the barriers are. Share ideas on how we can improve access. Activities will be provided for children. 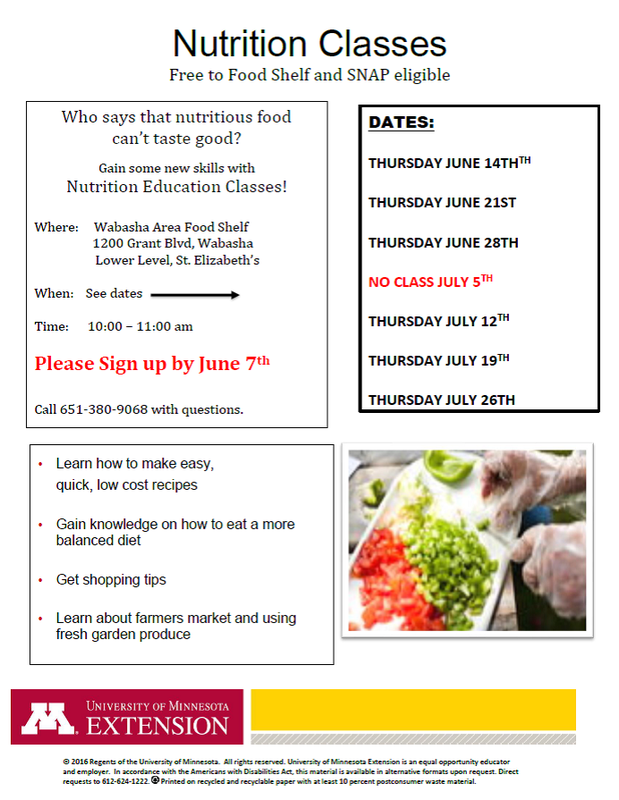 Sponsored by MN Food Charter Network, U of M Extension Health and Nutrition, and the Statewide Health Improvement Partnership. Cost will be $150 per attendee. 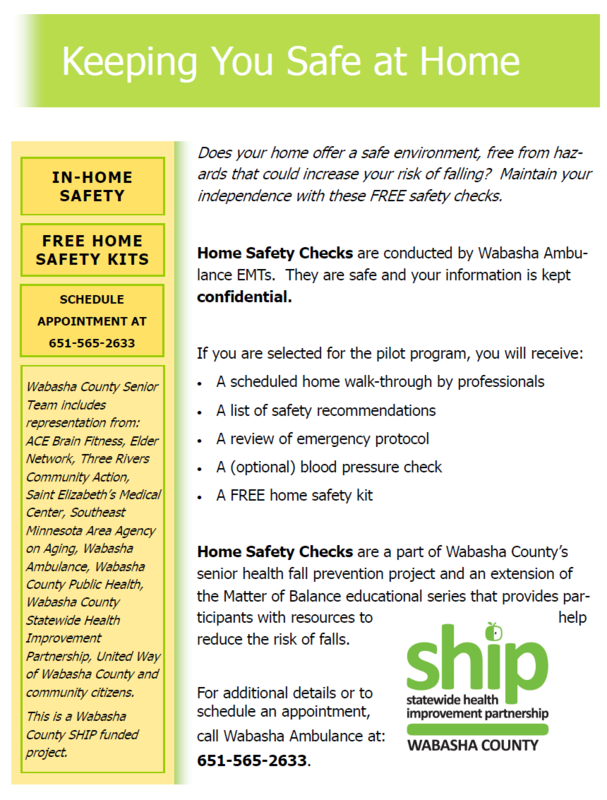 FREE Home Safety Checks are available to Wabasha homeowners aged 55+ who are living independently in their home or apartment. The goal of this pilot project is to help you identify ways to reduce the risk of falling and provide information and resources to maintain a safe environment so you can stay independent, enjoy peace of mind, and protect your health. Safety Checks will be conducted by Wabasha Ambulance EMTs who have received special training and will include a walk-through of your home and entryways, safety recommendations, and review what to do in case of an emergency. EMTs will also offer an optional blood pressure check. Participants will receive a free home safety kit. Safety Checks are offered the 1st and 3rd Wednesdays from 9:00 AM - 3:00 PM in July, August and September 2017. Call Wabasha Ambulance at 651-565-2633 to schedule your free appointment. A group workshop designed to manage falls and increase activity levels. 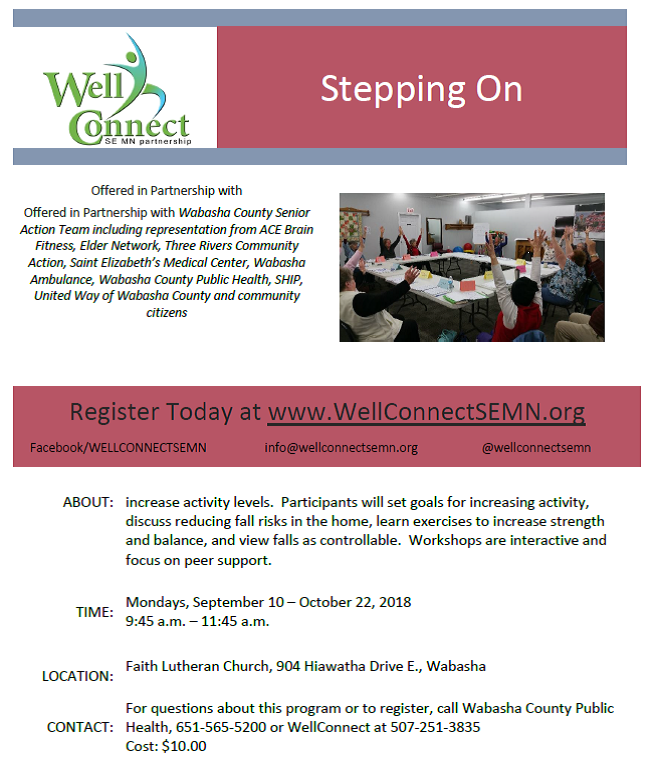 Participants will set goals for increasing activity, discuss reducing fall risks in the home, learn exercises to increase strength and balance, and view falls as controllable. Workshops are interactive and focus on peer support. This program is brought to you by the Wabasha County Senior Action Team and includes a fee of $10 for 8 classes and a workbook. To register, call Wabasha County Public Health at 651-565-5200 or WellConnect at 507-251-3835. An evidence-based exercise and fall prevention program for people of all ages. Class meets on Tuesdays and Thursdays, 9:45-10:45AM, from September 12 - November 30. Only $75 for 12 weeks/24 sessions. This program is brought to you by the Wabasha County Senior Action Team. Call Wabasha County Public Health to register 651-565-5200, or online at www.WellConnectSEMN.org. Class meets on Tuesdays and Thursdays, 5:30-6:30pm, from September 12 - November 30. Only $75 for 12 weeks/24 sessions. Class meets on Mondays and Wednesdays, 5:30-6:30pm, from September 11 - November 29. Only $75 for 12 weeks/24 sessions. Registration required for this 6 week class. Living well with Chronic Conditions is a proven self-management program for people living with chronic health conditions like heart disease, diabetes, arthritis, COPD, and others. This class is designed to help you learn skills to manage these conditions on a daily basis. Safety Checks will be conducted by Wabasha Ambulance EMTs who have received social training and will include a walk-through of your home and entryways, safety recommendations, and review what to do in case of an emergency. EMTs will also offer an optional blood pressure check. Participants will receive a free home safety kit.